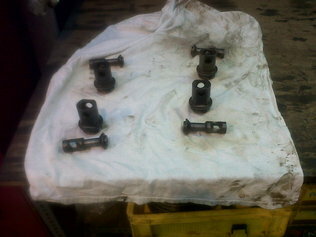 Cylinder draincocks now dismantled and cleaned. 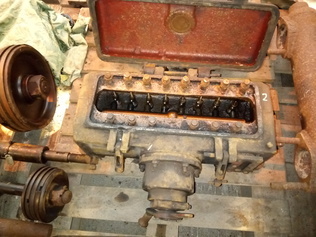 We'll lap the valves in and then re-use them. 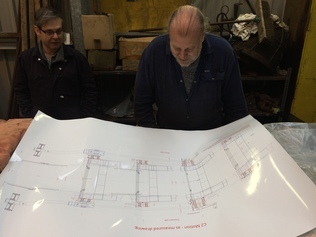 Dave and Erle study a print-out of the coupling rod assembly drawing. 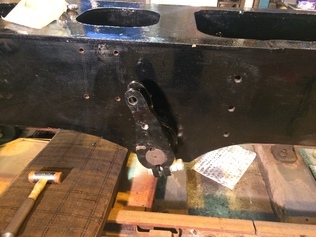 Loco brake weighshaft and crank now trial assembled, seen here from the driver's side. 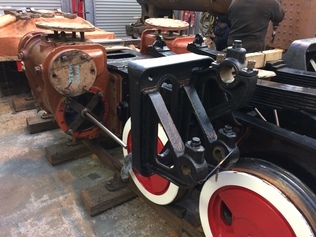 The steam brake cylinder will bolt on to those four holes on the left. 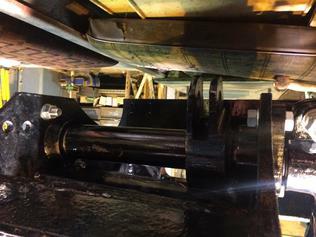 Loco brake weighshaft and crank now trial assembled, seen here from underneath. Oh, and the photo's inverted! 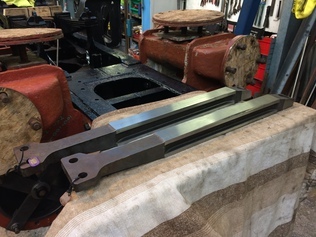 Loco brake weighshaft and crank now trial assembled, seen here from the fireman's side. 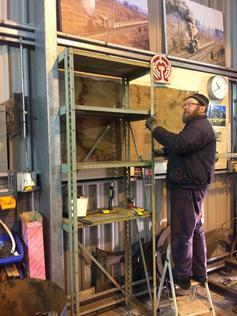 Dave's new set of shelves, with space for the gas bottle trolley underneath. Erle in the design office. This is usually Paul's job but he's spent too much time looking at a laptop recently so was very glad to do some practical work for a change. 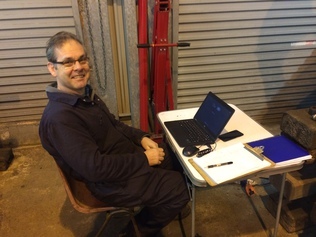 Erle is doing a marvellous job with the coupling rod assembly drawings. 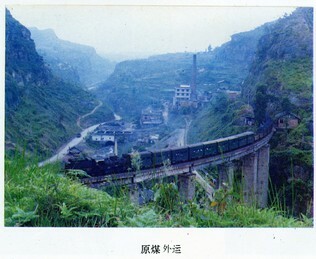 A coal train hauled by a Shijiazhuang-built 28t loco (equivalent to a C2) crosses the high curved viaduct on the Weiyuan Coal Railway on 2nd April 2007, not long before the line closed. 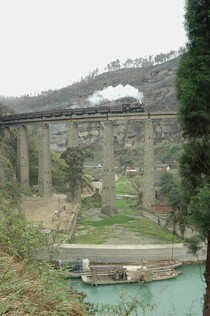 On the same viaduct but many years earlier, a similar loco hauls a mixed train including nine passenger coaches, two open wagons and a string of coal wagons. 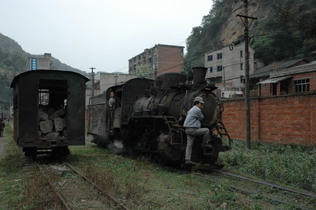 Seen at Huangjinggou in 2007 is one of the last surviving passenger carriages, loaded with rocks! 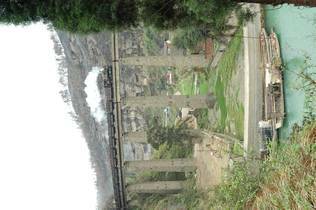 The loco and track had seen better days too. 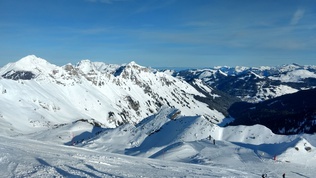 Andrew is enjoying the snowy slopes in Europe this week! One of the lubricators, partially dismantled. 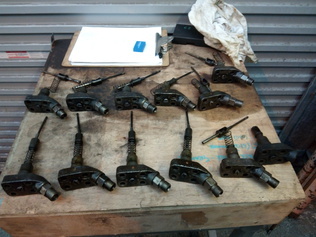 The pump units from a mechanical lubricator: there are 14 pumps in each one. Anatomy of a mechanical lubricator. 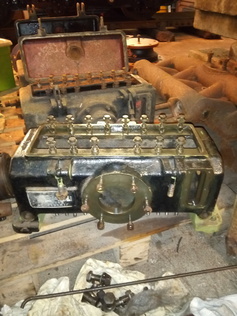 We have three of these plus some spares, and require two for the loco. 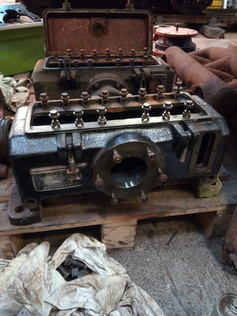 Erle is preparing to refurbish all three. 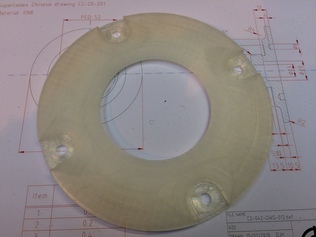 A 3D print of a connecting rod bearing cover. 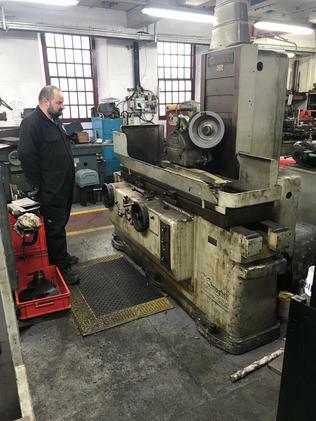 We'll have to machine these from steel, but this plastic one will help us to validate the exact dimensions that we have determined from Erle's drawings. 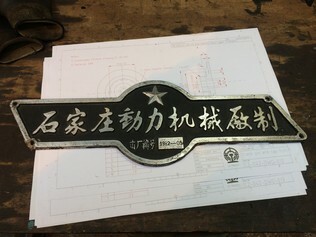 Loco numberplate from the Weihe Forestry Railway. These were common on some C2 fleets, especially the forestry lines. As far as we know, ours only ever had its number painted on. This was a gift from Robin Gibbons and we are considering whether to keep it or sell it for additional funds. 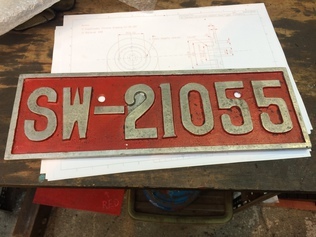 Another interesting chunk of aluminium we have recently acquired is this worksplate from a 28t loco built at Shijiazhuang. 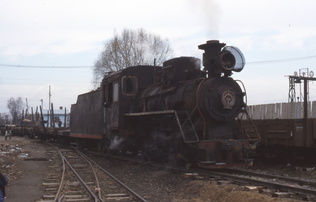 Strictly this would be a ZM16-4 class, though they were very similar to the C2s built at Harbin and the term C2 is now commonly applied to locos from both factories. Sorry, this one isn't for sale! 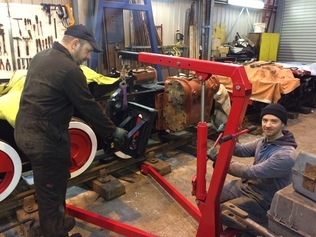 With both cylinders bolted in place, Alan and Andrew position one of the motion brackets. 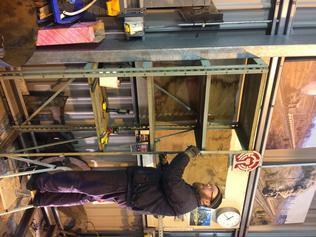 With the cylinders and motion brackets trial-fitted on both sides, we can start to check the alignment using the X-shaped jigs made by Alan. 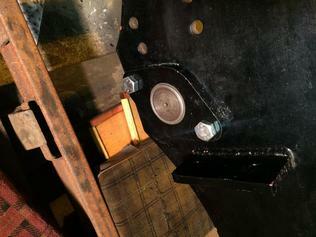 The slidebars are now ready to be trial-fitted for an initial measure up to check the alignment. 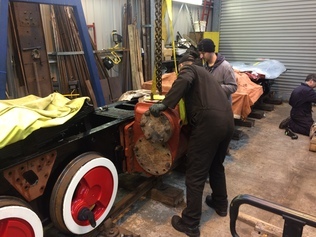 Alan and Andrew position the first cylinder for its trial fit to the frames.